This is a post recommending that you buy a particular book. Now I’ve written many book reviews in the past, recommended that you read many books in the past. So what’s so different about this particular book? What makes it special? Well, first off, I haven’t actually read the book. It hasn’t been published as yet. It may not quite be written as yet. What am I doing reviewing and recommending a book that may not have been written yet? I love the idea of the book, and want to promote it. 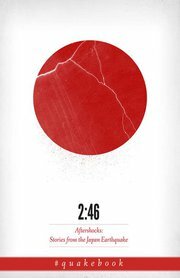 A Twitter-sourced charity book about how the Great Kanto Pacific Earthquake at 2:46 on March 11, 2011 affected us all. All proceeds from the QuakeBook Book go to the Japan Red Cross. Interesting in finding out more about the book’s origins? 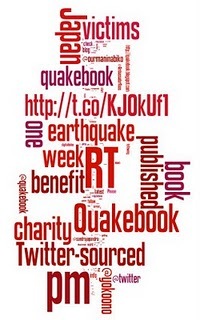 Then check out #quakebook on Twitter. Want to keep in touch with what’s happening with the book? Then follow @quakebook on twitter. Want to donate now, rather than wait for the book? (Yes, I know you’ve already donated, this is to encourage you to donate more). Then buy the poster. Not really a twitter kind of person, more of a LinkedIn type? Then check this out. Or maybe you’re more mainstream, so facebook is more your thing? Then go here. Why wait? Why not just go and put your name down to buy the book as soon as it is out? Then just go here. Do it now. Blog it. Tweet it. Like it. Share it. A coda. Why? Because somehow the #quakebook phenomenon seemed to go well with the understated stoicness of the people of Japan, particularly at this time. Time for us to stand with the people of Japan. The people who gave us bonsai. The haiku. Origami. Chanoyu. Netsuke. Sashimi. The list is endless. A way of life, styles and habits, an entire culture steeped in dignity and consideration and respect and patience. I think the only reason it isn’t available is because of Amazon. It has to be sold from one place with all the money going to the Red Cross, and I don’t think Amazon is geared up to work this fast. I believe the book is ready now. We will all have to be patient a while longer. I am going to buy a copy for my grandchildren to keep. Another Great Earthquake outcome is information sources. Up and down the US west coast, young researchers in universities have innovated to measure the radiation plumes carried by the weather, creating sources independent of government labs. To cross check readings, new ‘trusted spaces’ security models have come about.